Now that you have designed an architecture for how you will use the various components of Freedom Fone to design an information service, you will need to think about creating voice menus. The last thing that you want when building a voice menu is to bore your audience or even worse let them get lost in the menu. Stick to simple language which people can understand; avoid using complicated medical or legal terms for example. Keep your introduction short it is important that you let your callers know what to expect immediately: example: "Welcome to the Cholera epidemics emergency information service". Limit the number of menu choices: People tend to forget if they are offered too many choices. Make a pleasant error message: The system should always take the blame for errors. "Sorry, I do not understand your choice; do you want to press another number?" Keep your information up to date: Let your audience know how often they can expect to find new information on your service. This will help you keep them calling back. "Welcome to the Cholera epidemics emergency information service ; this information is updated twice a day. Please listen carefully to the following five options"
To end this call, just hang up. For more information about how to create voice menus in the Freedom Fone software, see the Chapter Voice menus in the Setting up section. When considering the voice that will be used on the audio menus (the host), consider choosing someone who the audience likes and can connect with - in our experience callers prefer to hear a female voice as a host. The Language Selector helps you manage multilingual voice menus. If, for example, you want to deliver your voice menus in English and Swahili, you would first need to create separate content files and voice menus for each language. Thereafter, you can link the voice menus using the Language Selector. 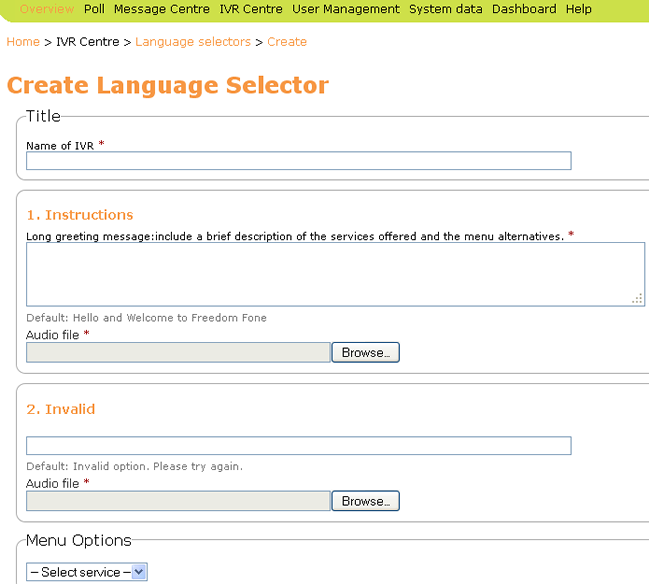 To create a language selector, navigate to IVR Centre > Language Selector. On the page shown below, click on the Create New button. On the next page, shown below, you enter the name of the Language Selector and upload the audio files for the instructions and the invalid message. At the bottom of the page, under Menu Options, select the type of service (Voice menus, Leave-a-message menu, Content) you wish to link to the top menu of your language selector. If you have created the same voice menu in different languages, you would select Voice Menus from the pull down menu. Once you have made a selection, further options will become available to you, enabling you to set up navigation for your voice menus. 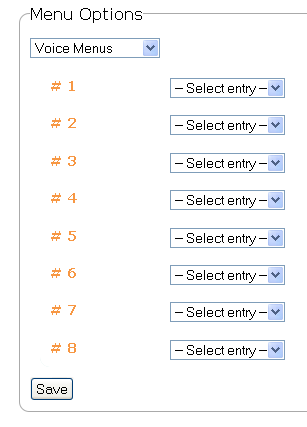 Save the page after making your selections. Once you have created a Language Selector you can return to edit it using the edit icon on the Language Selectors page. You will note that the Edit Language Selector page looks just like the Edit Voice Menus page. What does Freedom Fone do?